TMV stands for thermostatic mixing valve. These specialist valves are designed to ensure the flow of water from an outlet fitted with one cannot become too hot. With hundreds of thousands of burns and scalds occurring in the UK annually, both TMV2 and TMV3 valves have the potential to prevent many such cases from happening – particularly as a majority are caused by hot water scalding the skin. The installation of TMVs should be done by an experienced person such as a qualified plumber, and they should also be checked, cleaned and maintained regularly to ensure they are working as they should be. There are two types of valves, TMV2 and TMV3 and we’ll take a look at the differences here. A TMV2 fitting is designed for use in a domestic environment. They work with water pressures of between 0.1 bar and 5 bar, and are ideal for use in households and other domestic settings. TMV3 fittings have been specifically designed for use in healthcare environments. Hospitals, care homes, and other similar settings must use these; installing TMV2 valves would not suffice. TMV3’s adhere to the NHS D08 regulatory standard, whereas the TMV2 example adheres to two British Standards, but will not meet the NHS requirements. TMV3 fittings are also designed to work with much higher water pressures, from 0.2 bar to 10 bar. It would be entirely possible for someone to install these valves in the wrong place. If this occurred, they may not achieve the desired outcome – protecting people from scalding water. Additionally, hospitals and other healthcare settings should ensure the valves are checked, cleaned and maintained regularly. 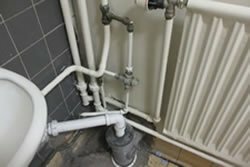 There is also a risk that the build-up of harmful bacteria, including legionella bacteria, could easily occur if they are not attended to regularly enough. As such, the usual approach to monitoring the presence of legionella bacteria and maintaining the water system should be reviewed to account for any new valves that are fitted. Regular testing may then need to include these valves. Regular cleaning and disinfection processes might also need to consider the valves that have been fitted. 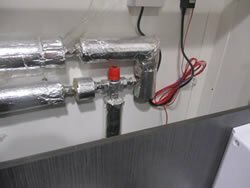 Just as the installation of TMVs can prevent many of the scalding incidents that occur each year, so proper maintenance of water systems can also help to prevent Legionella multiplication and contamination. 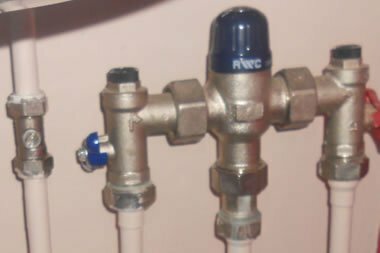 By installing the right valves for your needs (TMV2 or TMV3), and factoring in any changes to your health and safety approach, all these elements should be taken care of. Always follow health and safety advice when installing and maintaining the valves, to ensure they always give excellent service and never create a health risk of a different kind.